If you haven’t seen Dana Carvey’s: Straight White Male, 60, you should absolutely go watch it on Netflix now. After you do, you will never say “sweet potato” the same way again. 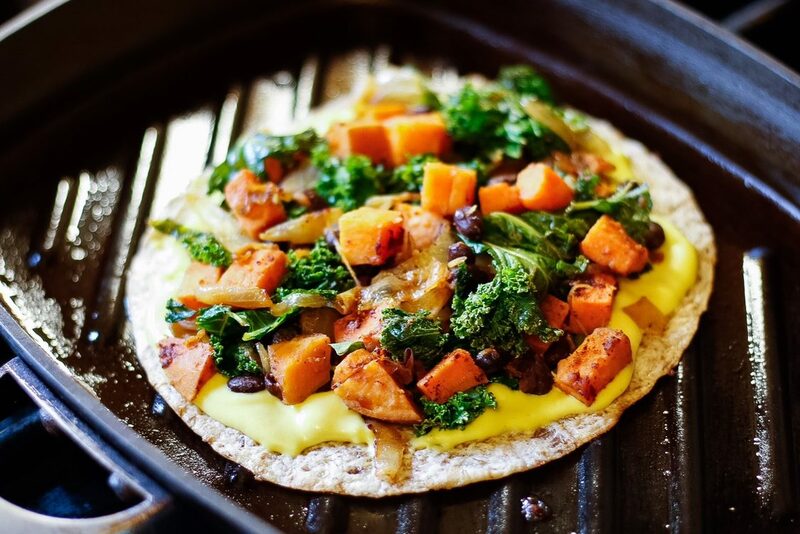 And then you will understand why I couldn’t get his voice out of my head the entire time I was making this Sweet Potato Quesadilla with Kale and Caramelized Onions. 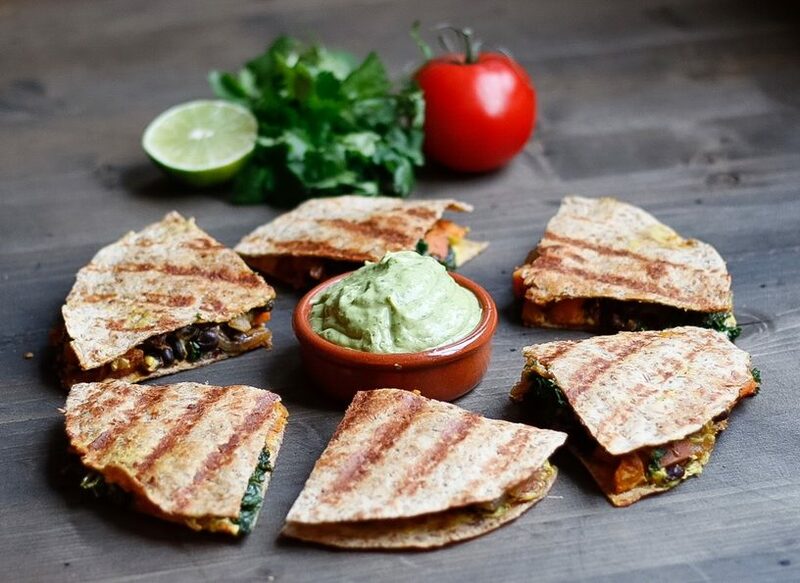 This recipe was inspired by a similar dish at Rooted, a vegan restaurant in Cincinnati, Ohio, and I think my recreation has come pretty dang close, seeing as the first round of these quesadilla’s was devoured in a matter of minutes. 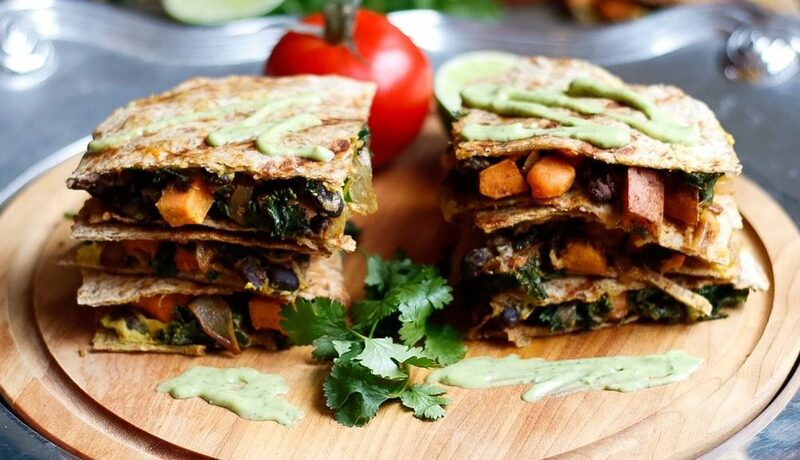 It’s not hard to see why- each crispy tortilla is filled with caramelized onions, diced sweet potato, hearty black beans, crunchy kale, then finished off with smooth avocado cream. Yea, it’s kind of a big deal. 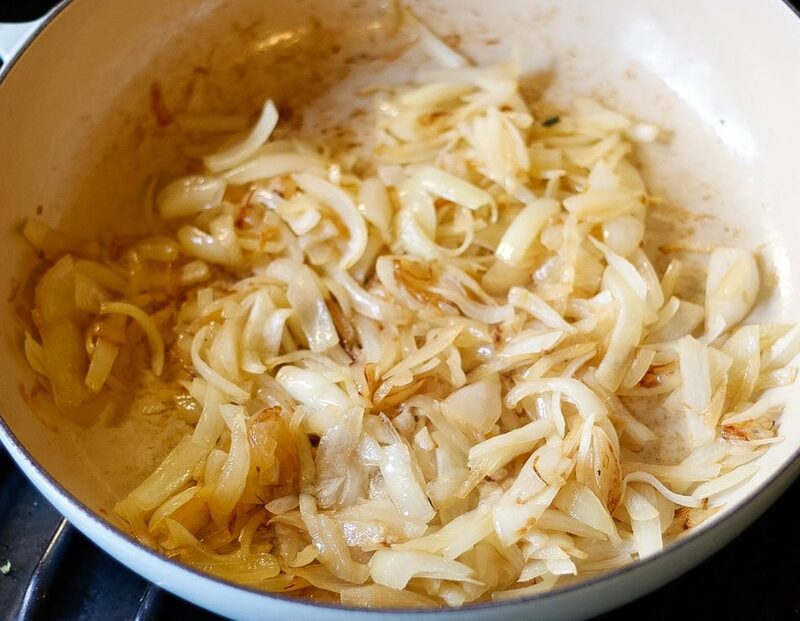 First up- caramelize the onions. The trick here is to cook them low and slow. 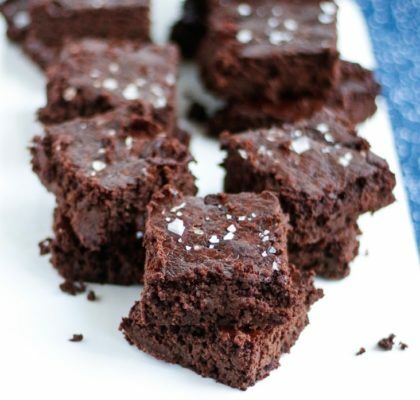 This allows them to soften, turn that beautiful golden color, and most importantly, they turn into the sweetest addition to just about any dish! Patience is a must in this step. Next, you will add the diced sweet potato. You can leave the peels on or take them off, it really does not matter much, so long as you dice the potatoes in similar size. You will want them to be pretty small too so they cook faster, and are easy to fit inside the tortillas. Once the potatoes are softened, toss in the kale, beans, chili powder and salt, and just stir until the kale starts to wilt. Finally, its time to assemble! Heat a skillet or grill pan with some non stick spray, then put one tortilla down, cheese of your choice, 1/2 cup of filling, then the other tortilla. Allow to toast a few minutes per side, until both ends are golden and crisp. If you plan to eat this as a meal instead of a party appetizer, save yourself some calories and just eat it open faced instead of adding on the top layer. 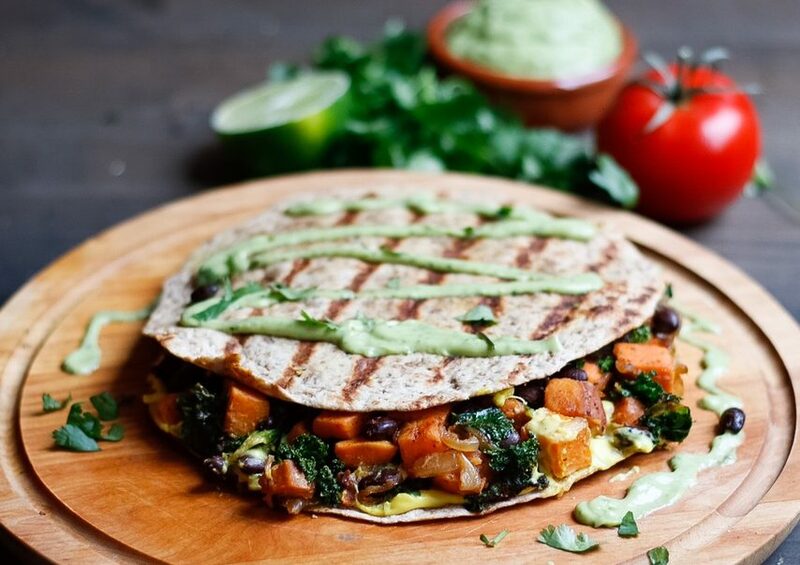 To be honest, the filling of this Sweet Potato Quesadilla with Kale & Caramelized Onions is so freaking delicious, you could just stir fry this up and eat it will tortilla chips, if you don’t want to go through the trouble of putting the quesadillas together. Or, a make ahead tip I often use is to assemble all the quesadillas the morning of a party, cut them into quarters and arrange on a parchment lined baking sheet. Then, just toast them up for 10-15 minutes at 350F when ready to serve, and drizzle with the avocado crema before eating. 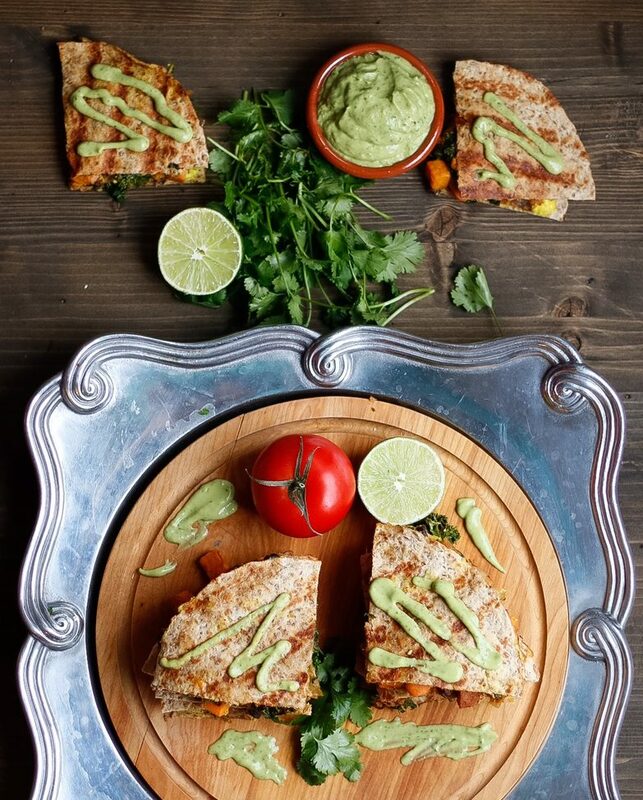 This saves you the hassle of hovering over a stove flipping quesadillas when you’re also trying to entertain guests. 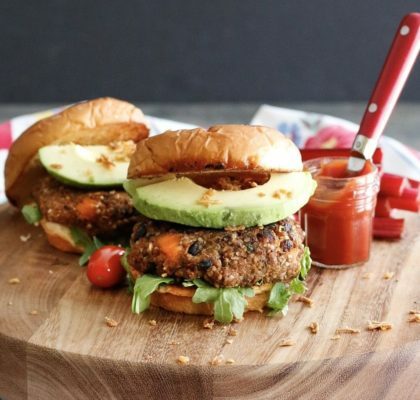 I hope you enjoy my third healthy appetizer suggestion for the big game this Sunday! By the way, who are you rooting for? Let me know in the comments below! -Using a small food processor, puree until smooth. Adjust seasonings to taste. Heat the olive oil in a large sauté pan, and add the onions. Cook over medium about 15-20 minutes, until they start to turn golden brown. Meanwhile, dice the sweet potato, peeling first if you are choosing to do so. 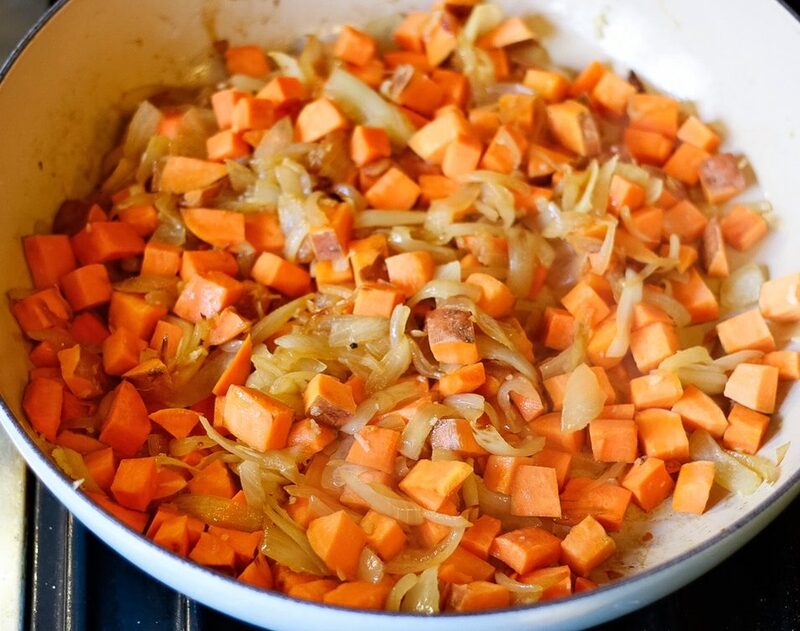 Add the sweet potato and crushed garlic to the pan, stir to coat with the onions. Add 1T of water if the pan starts to get too dry and the veggies start to stick. Saute uncovered ~10 minutes. Add 1/4 cup water, cover the pan, and allow to cook 5-10 minutes until all the water is evaporated and the potatoes are softened. 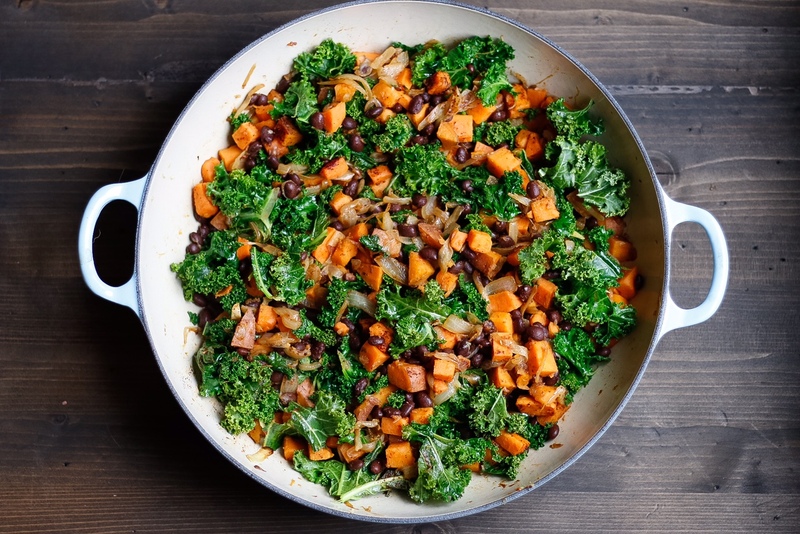 While the veggies are steaming, wash and tear the kale, and drain and rinse the black beans. 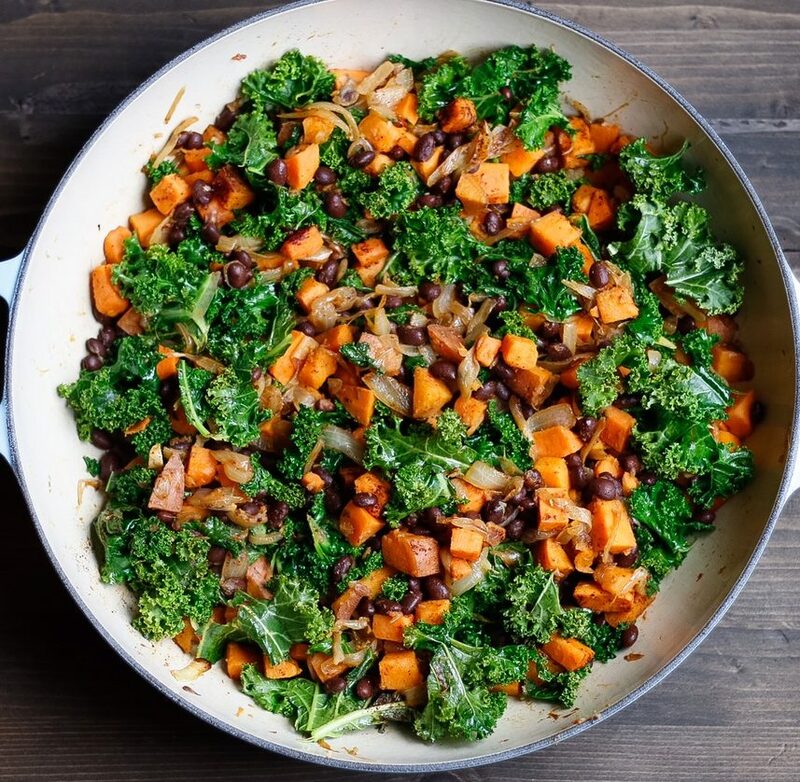 Once all the water is evaporated from the pan, add the kale, beans, chili powder, and salt, stirring to combine and cooking until the kale is wilted. Adjust seasonings to taste, then set aside the mixture until you’re ready to make the quesadillas. Preheat a large skillet or grill pan, spraying with non stick spray or a very light coating of oil. Place one tortilla down, spread vegan cheese or sprinkle regular cheese on top. Then, scoop in ~1/2 cup of the filling (more or less to preference), top with a second tortilla, and allow to cook until the bottom tortilla starts to turn golden. Flip, cooking until the cheese is melty and the second tortilla is crisp. Remove from the pan, slice into quarters, and repeat with remaining ingredients. Serve hot topped with avocado crema or just some diced avocado. Soak the cashews 4-24 hours until very soft, or boil 10-15 minutes. Drain the cashews then combine everything together in a high powered blender, mixing until completely smooth (this may take a few minutes). Pour into a small sauce pan over medium heat. Cook until it starts to thicken- stirring frequently so it doesn’t clump. 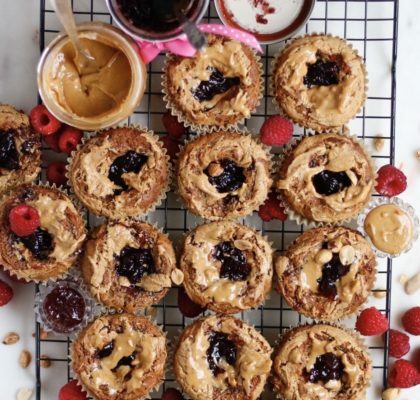 Eat immediately or store in an air tight container in the fridge!